Knowledge workers manage multiple tasks, collaborate effectively among several colleagues, and manipulate information most relevant to their current task by leveraging the spatial organization of their work area. The diversity of these work practices and the complexity of implementing flexible computing tools make it difficult to meet these workers' needs. However, a common thread among all of these practices that can be leveraged to provide more appropriate computational support for knowledge work is their relationship to the construct of an activity: a collection of tools (applications, documents, and other resources) within a social and organizational context and in service of an objective or goal. 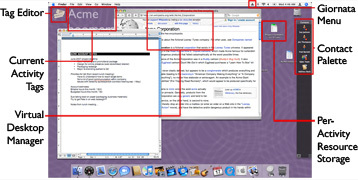 Multitasking inherently reflects the boundaries between ongoing activities, collaboration with particular colleagues often takes place within the context of one or more activities, and the "files and piles" used to spatially organize the contents of a workspace are an important component in classifying information, also closely related to the activities at hand. In my dissertation research, I identified a set of key challenges, grounded in theory and practice, for the research and development of activity-based systems. I addressed these challenges and incorporated lessons learned from previous technological explorations in a new research prototype, the Giornata system. Through Giornata, I sought to demonstrate how the traditional desktop metaphor could be re-envisioned to better match knowledge workers' practices by emphasizing activity as a primary organizing principle in GUI-based interaction. Voida, S., & Mynatt, E.D. (2009). “It feels better than filing”: Everyday work experiences in an activity-based computing system. In Proceedings of the SIGCHI Conference on Human Factors in Computing Systems (CHI 2009, pp. 259–268), Boston, Massachusetts, April 4–9. ACM Press. Voida, S., Mynatt, E.D., & Edwards, W.K. (2008). Re-framing the desktop interface to support activity-based knowledge work. In Proceedings of the 21st ACM Symposium on User Interface Software and Technology (UIST 2008, pp. 211–220), Monterey, California, October 19–22. ACM Press.